What are the political implications of meeting the established human right for everyone to enjoy an adequate standard of living? In short, it necessitates a redistribution of wealth and resources on an unprecedented scale, which is why activists should resurrect the United Nations’ radical vision for achieving Article 25. 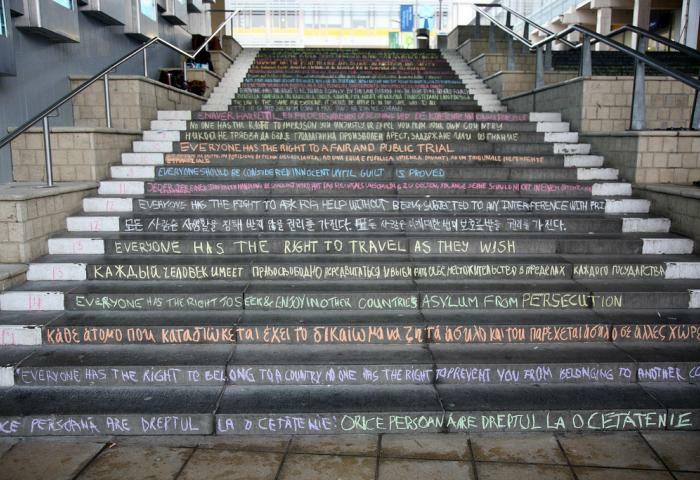 The Universal Declaration of Human Rights is one of the most translated and celebrated documents in the world, marking its 70th anniversary this year. But relatively few people are aware of the significance of its 25th Article, which proclaims the right of everyone to an adequate standard of living—including food, housing, healthcare, social services and basic financial security. As our campaign group Share The World’s Resources (STWR) has long proposed, it is high time that activists for global justice reclaim the vision that is spelled out in those few simple sentences. For in order to implement Article 25 into a set of binding, enforceable obligations through domestic and international laws, the implications are potentially revolutionary. Since the Universal Declaration was adopted by the General Assembly in 1948, the United Nations never promised to do anything more than “promote” and “encourage respect for” human rights, without explicit legal force. The Universal Declaration may form part of so-called customary international law, laying out a value-based framework that can be used to exert moral pressure on governments who violate any of its articles. But in the past 70 years, no government has seriously attempted to adapt its behaviour in line with the Declaration’s far-reaching requirements. While civil and political rights have enjoyed an increasing degree of implementation throughout the world, the historical record on economic and social rights is far less sanguine. This is forcefully illustrated by the UN’s current Special Rapporteur on extreme poverty and human rights, Philip Alston. In his first report submitted to the Human Rights Council, he argued that economic and social rights are marginalised in most contexts, without proper legal recognition and accountability mechanisms in place. Indeed, he even questioned the extent to which States treat them as human rights at all, and not just desirable long-term goals. Even many of the States that enjoy the world’s highest living standards have disregarded proposals to recognise these rights in legislative or constitutional form. Most of all, the United States has persistently rejected the idea that economic and social rights are full-fledged human rights, in the sense of “rights” that might be amenable to any method of enforcement. It is the only developed country to insist that, in effect, its government has no obligation to safeguard the rights of citizens to jobs, housing, education and an adequate standard of living. In their defence, governments may point out the historical progress made in reducing extreme poverty across the world, which has generally been achieved without adopting a strategy based on the full recognition of economic and social rights. But the extent to which these rights remain unmet for millions of people today is unconscionable from any kind of moral perspective. Consider that more than 60 percent of the world population struggles to live on less than $5 per day, an amount which the United Nations Conference on Trade and Development (UNCTAD) has considered the minimum daily income which could reasonably be regarded as fulfilling the right to “a standard of living adequate for… health and well-being”, as stipulated in Article 25. The International Labour Organisation of the United Nations also estimates that only 27 percent of people worldwide have access to comprehensive social security systems, despite almost every government recognising the fundamental right to social security, as also enshrined in Article 25. The fact that many thousands of people continue to die each day from poverty-related causes, while the number of chronically undernourished people increases once again, is an affront to the very idea that everyone has the right to an adequate standard of living. Even in the most affluent nations, millions of people lack access to the financial system, struggle to pay for food or utilities and die prematurely. Across the European Union, for example, one in four people are experiencing income poverty, severe material deprivation and/or social exclusion. There is no country which has secured fundamental socioeconomic rights for the entire population, including the generous welfare states of Scandinavia that are also being gradually eroded by market-driven policies. Such facts demonstrate how far we have strayed from realising the modest aspiration expressed in Article 25. The challenge is well recognised by civil society groups that advocate for a new direction in economic policymaking, beginning with a reversal of the austerity measures that are now expected to affect nearly 80 percent of the global population within a couple of years. Rendering Article 25 into a truly “indivisible”, “inalienable” and “universal” human right would therefore mean, inter alia, reforming unfair tax policies that undermine the capacity of countries to invest in universal social protection systems. It would mean rolling back the wave of commercialisation that is increasingly entering the health sector and other essential public services, with extremely negative consequences for human wellbeing. It would also demand regulatory oversight to hold the out-of-control finance sector to account, as well as domestic legislative action in support of a living wage and core labour rights. In short, implementing Article 25 would call for a redistribution of wealth, power and income on an unprecedented scale within and between every society, in contradistinction to the prevailing economic ideology of our time—an ideology that falsely views economic and social rights as inimical to “wealth creation”, “economic growth” and “international competitiveness”. This only serves to underline the enormous political implications of achieving Article 25. For it is clear that rich countries prefer to extract wealth from the global South, rather than share their wealth in any meaningful way through a redistribution of resources. Yet we know the resources are available, if government priorities are fundamentally reoriented towards safeguarding the basic needs of all peoples everywhere. To be sure, just a fraction of the amount spent on a recent US arms deal with Saudi Arabia, estimated at over $110 billion, would be enough to lift everyone above the extreme poverty line as defined by the World Bank. If concerted action was taken by the international community to phase out tax havens and prevent tax dodging by large corporations, then developing countries could recover trillions of dollars each year for human rights protection and spending on public services. Fulfilling the common people’s dream of “freedom from fear and want”, therefore, is not about merely upscaling aid as a form of charity; it is about the kind of systemic transformations that are necessary for everyone to enjoy dignified lives in more equal societies with economic justice. These are just some of the reasons why the human rights of Article 25, however simply worded and unassuming, hold the potential to revolutionise the unfair structures and rules of our unequal world. Because if those rights are vociferously advocated by enough of the world’s people, there is no estimating the political transformations that would unfold. That is why STWR calls on global activists to jointly herald Article 25 through massive and continual demonstrations in all countries, as set out in our flagship publication. The UN Charter famously invokes “We the Peoples”, but it is up to us to resurrect the UN’s founding ideal of promoting social progress and better standards of life for everyone in the world. It is high time we seized upon Article 25 and reclaimed its stipulations as “a law of the will of the people”, until governments finally begin to take seriously the full realisation of their pledge set forth in the Universal Declaration.